LEWISBURG, Pa. — The record-long government shutdown dropped President Trump’s approval rating to its lowest level in more than a year at 34 percent according to the latest survey by The Associated Press-NORC Center for Public Affairs Research. And a recent Bucknell Institute for Public Policy (BIPP) survey suggests that Trump’s presidency was already signaling trouble for the Republican Party before the shutdown, particularly among younger voters and political independents. The national survey, conducted Nov. 10-14 by BIPP’s Survey Research Laboratory, found that 44 percent of Americans said that Trump’s presidential term will make them less likely to support Republicans in the future, compared to 31 percent who said it would make them more likely to support Republican candidates in the future. Forty-eight percent of the respondents said Trump’s term made them feel less supportive of the Republican Party. The numbers for Republicans were significantly worse among young people. Just 17 percent of Americans under 35 said that Trump’s term would make them more likely to support Republican candidates in the future, compared to almost half (45 percent) of Americans 55 and over. While gender gaps persist among all Americans in evaluations of Trump, they are most pronounced among younger voters. Eleven percent of women under 35, compared to 24 percent of men, say that Trump’s term in office has made them more likely to vote for Republicans in the future. And 8 percent of women under 35, compared to 30 percent of men, say that Trump has made them more supportive of the Republican Party. Perhaps most distressingly for Republicans, Trump is also viewed negatively by younger people who do not affiliate with a political party. Just 9 percent of self-identified political independents under 35 say that Trump’s time in office will make them more likely to vote for Republicans in the future, while 55 percent say that it will make them less likely to vote for Republicans. While Trump remains relatively popular among younger Republicans, they are by far the most supportive of a primary challenge to Trump in 2020. Thirty-seven percent of Republicans under 35 agree with the notion that there should be another Republican challenger for the nomination in 2020, compared to 21 percent of Republicans age 35-54 and 14 percent over 55. 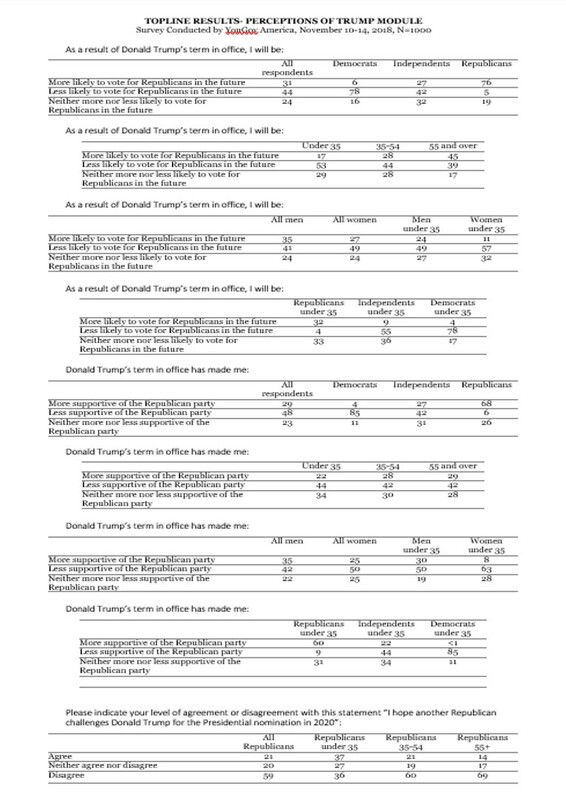 About a third of Republicans under 35 (36 percent) reject the idea that Trump should face a primary challenge, compared to 60 percent of those 35-54 and 69 percent of those over 55.